If you think you’re too old to jump in and play a fun game of weekend rugby, think again. 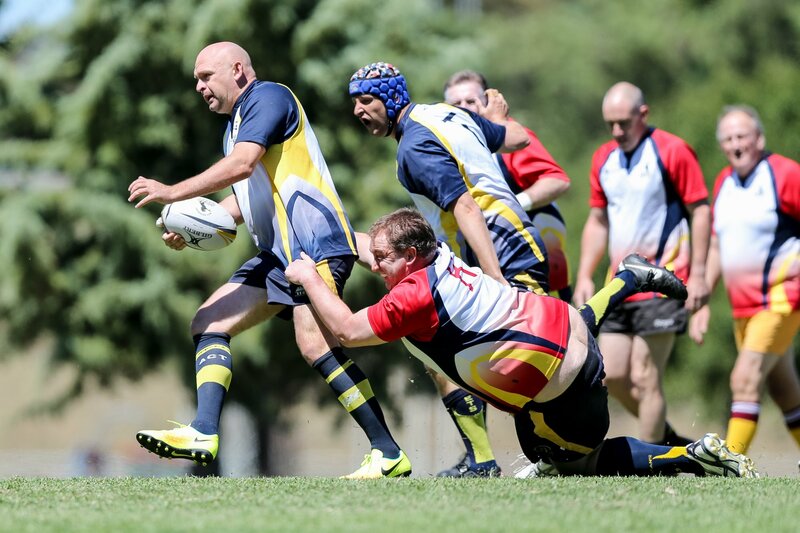 The ACT Veterans Rugby Club is now in its 22nd season, with rugby players from Canberra and surrounding districts coming together every few weeks for a fun game, and a post-match social drink. You have to be aged 35 or older to join, but there is no limit; the oldest player recently turned 81 years old! Besides offering blokes the chance to stay fit, make friends and have a bit of fun, the boys have created an impressive club – playing one game per season as a curtain raiser for a Brumbies match, and supporting the local community through avid fundraising. In 10 years they have attracted a number of sponsors and raised almost $240,000 for charities such as: Legacy, Menslink, the George Gregan Foundation, Snowy Hydro Southcare, the Paediatrics Unit of the Canberra Hospital and Clare Holland House. One of the founders of the ACT Vets was Jayson Hinder, former Chairman of the Canberra Community Bank Group who sadly passed away recently in a motorcycle accident. Jayson loved the game, and had organised for the Community Bank Group (aka Bendigo Bank in Curtin, Calwell, Wanniassa and Jerrabomberra) to sponsor the opening match of every season in memory of another founding player who passed away in 2008 from a brain tumour, aged just 49: Anthony ‘Tony’ Ryan. Tony was a true lover of Canberra and rugby, having played in Marist College teams and been selected for the 1976 Australian Schoolboys rugby team alongside Wally Lewis. He was a big part of ACT Vets until his cancer diagnosis forced him to stop playing. Tony spent the last days of his life at Clare Holland House, a specialist palliative care service run by Calvary Public Hospital which helps patients with chronic illness (and their loved ones) enjoy a better quality of life while still receiving appropriate care. 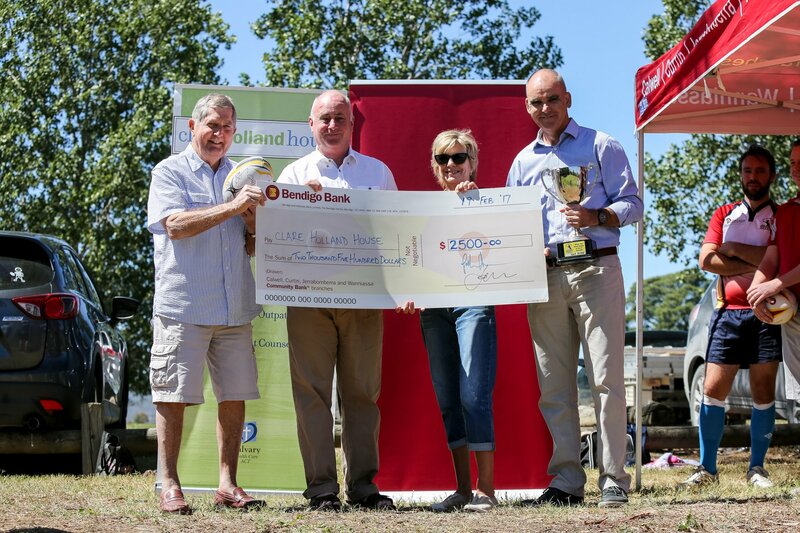 The season opener was dubbed the ‘Tony Ryan Memorial game’, sponsored by the Canberra Community Bank Group and all funds being donated to Clare Holland House. Nine years later it’s still going strong, and this year’s donation of $2,500 will be used to improve the comfort and enjoyment of Clare Holland House patients and their families. Spectators also raised money during the game by handing around what’s fondly known as The Claire Holland House Cup. It’s such an admirable contribution from a bunch of blokes who proclaim to “just want to run around and have some fun.” They may be doing so, but they’re also making a big difference to the lives of others along the way. Visit ACT Veterans Rugby for more information about supporting or joining the team. Training is every Wednesday evening at Kapyong Field, RMC and the majority of weekend games are at Portsea Oval, RMC Duntroon. Players can choose to play week by week or sign up for a whole season. For more information on Bendigo Bank and the local initiatives and charities they support, visit Canberra Community Bank Group. Images courtesy of Michael Thompson Photography.